Sew what's cooking with Joan! 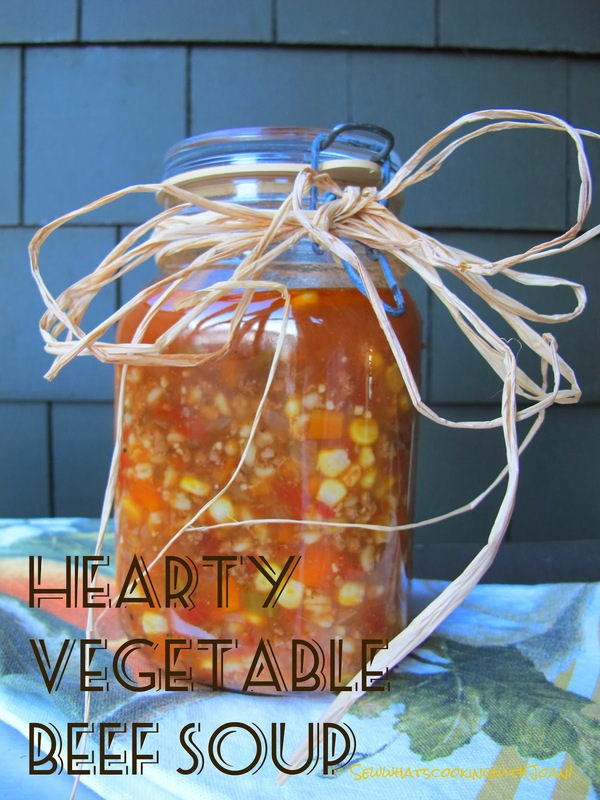 : Hearty Vegetable Beef Soup! 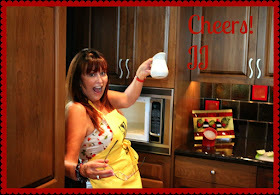 Amazingly, I have been swamped with e-mails, Facebook requests and written hugs, for writing a blog! I am pleased that you are enjoying it, and hope that at least once in a while, I help or entertain you! My blog has reached over 800 in 2 weeks time from all over the globe, US, Jamaica, South Korea, Russia, Mexico, Germany, Canada, Switzerland and the UK. WOW! Thank you! Today, I am offering one of my favorite soups. It is easy, but needs to simmer for 2 1/2 hours. It is well worth it and great for a cold day!! Bonus: it is "figure friendly"!!! This one's for you Andrew!! You will love it!! In a nonstick frying pan, brown the meat. Drain well and put into a stock pot. 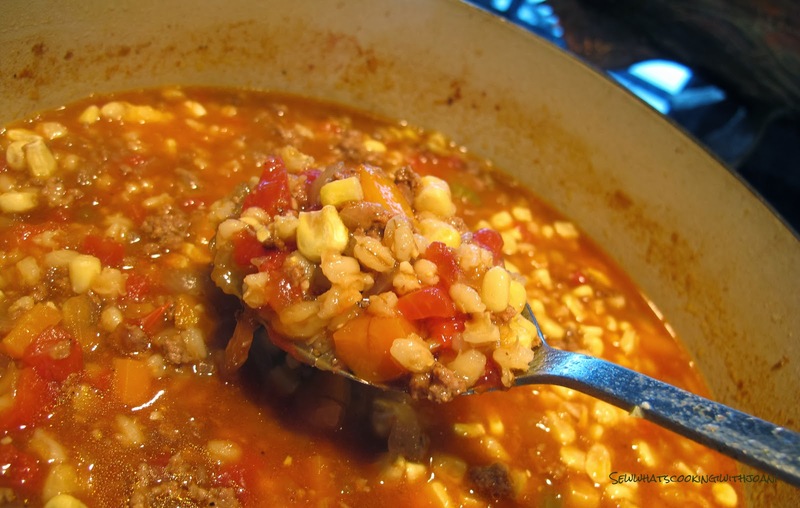 Add beef broth, tomatoes and remaining ingredients except peas, corn, salt and pepper. Bring to a boil, reduce heat and simmer, partially covered, for 2 1/2 hours. Add the frozen corn or peas. 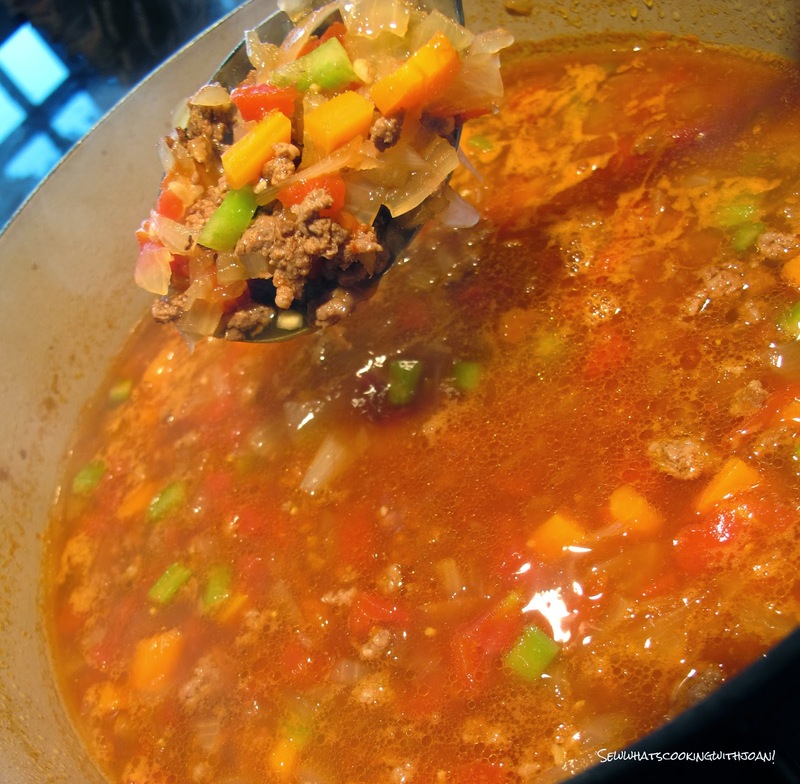 Simmer for 6-8 minutes. Moose and Bandit could not stand it, they sat at our feet Monday night as we watched Washington Husky's beat the Oregon Ducks......yipppeee! (this will get some blood flowing!!) I had made the entire St. Patrick's Day meal and my soda bread, we were happily enjoying both, the game and the meal! The pups wanted to jump into our lap and help!! Moose is looking at Wee Bear with his plate thinking, which will drop food.....which will drop food.....which will drop food????? ?